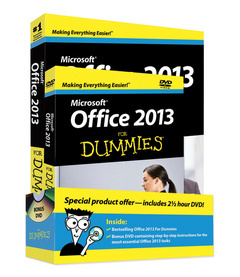 Get comfortable with the latest features of Office 2013 with this one–of–a–kind For Dummies book–and–DVD package. Featuring the bestselling Office For Dummies book, the bundle also includes a three–hour instructional DVD covering the most essential Office 2013 tasks. You′ll feel as if there is an Office expert by your side as you walk through popular topics, including word processing, presentations, data management and analysis, and much more. Start at the beginning or jump right to the task you′re looking for. Either way, you′ll be working your way through Word, Excel, Outlook, PowerPoint, and Access in no time! This book–and–DVD bundle takes the work out of learning Office 2013 so you can spend more time on making Office work for you!